Take a first class Korean Air cabin, and then mix together improperly served macadamia nuts, an entitled executive, a berated crew member and a turned-around airplane, and what do you get? An international incident that continues to unspool with public apologizes and rebukes. The scandal is also cracking open the shell of South Korea's chaebols, or the family-run conglomerates that control its economy, allowing non-Koreans to get a glimpse of the powerful families running the country's biggest companies. 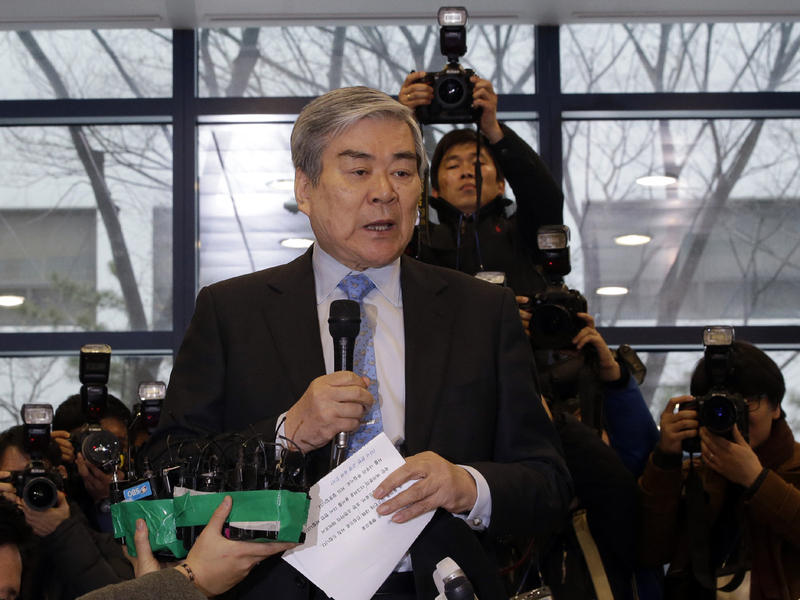 In the latest twist in the "nut rage" scandal, Korean Air chairman Cho Yang-ho apologized for the conduct of his daughter, an employee of the company who sparked the nut-rage incident, and called her "foolish." He also said he regretted not raising her better. For those not up to speed on the "nut rage" scandal, the incident took place in the cushy confines of a Korean Air first class cabin on Dec. 5, when Cho's daughter, Cho Hyun-ah, flew into a rage after a crew member improperly served macadamia nuts. Cho Hyun-ah, 40, who was in charge of overseeing the company's inflight service, apparently viewed the nutty faux-pas as a major incident. The employee's offense? Serving the nuts bagged, instead of on a plate. Then the real nutmeat of the drama happened: Cho ordered the plane back to the gate, and kicked off the offending crew member. That's led to outrage from many Koreans, as well as an investigation by the South Korean government about whether Cho violated aviation safety law. Given that most American flyers would be happy with a lowly bag of peanuts tossed in their direction, the incident is viewed as a slightly entertaining glimpse into not only another culture, as well as the hoity-toity atmosphere of a first class cabin. The scandal, which is transfixing Koreans and entertaining much of the rest of the world, proves that even if you sometimes feel like a nut, you shouldn't act like one. In the deeply entrenched culture of Korea's chaebols, that nut-rage scandal is shedding light on the ugly side of the family-run conglomerates: Nepotism, entitled behavior, and complicated ownership structures. With power concentrated in the hands of a few, that clearly results in the type of haughty behavior exemplified by Cho Hyun-ah. But back to the villain of the nut-rage incident. On Friday, Cho, who is also known by the English name Heather, publicly apologized in front of journalists, speaking in a voice that The Telegraph said was "almost inaudible." She vowed to meet with the (presumably traumatized) crew member and "apologize sincerely." She is also resigning from her remaining posts within the company, after previously stepping down from her inflight-service role. Cho Hyun-ah made the public apology before she met with Transport Ministry officials who were to question her about whether her actions violated the law. Cho isn't a stranger to outrage over her behavior: Last year, she traveled to Hawaii to give birth to twin boys, which will entitle them to U.S. citizenship. That angered some in South Korea, who felt the U.S. birth was a way for her to ensure her children would avoid the country's two-year compulsory military service for males. So what is a chaebol? Imagine a sprawling conglomerate like General Electric, but run by and controlled by one family. In South Korea, chaebols are the very lifeblood of the country, with the five largest bringing in two-thirds of South Korea's gross domestic product. Many of their names are familiar to Americans: Samsung, LG, Hyundai. But the inner workings of the chaebols are likely unfamiliar to many outside South Korea. Executives often hold less power than family members who are appointed to roles within the firms, and several family members have been involved in nepotism-tinged scandals. The power of the chaebols and the strong culture of nepotism have South Koreans worried, according to a May poll from the Segye Times and the Asan Institute for Policy Studies. Nine out of 10 Koreans in their 20s said that nepotism will ruin the country, the poll found. "It's my fault," he said. "As chairman and father, I ask for the public's generous forgiveness." But the real problem is likely not isolated to one bag of improperly prepared macadamia nuts, nor one entitled heiress and her father's inability to teach her right from wrong. It may be the chaebol's tendency to put heirs into prominent roles within the companies, leading to entitled behavior. "Among the causes of the collective ill feeling is the fact that second, third and fourth generations of owner families are automatically put into positions of management of these conglomerates," the Korea Times noted in an editorial on Tuesday. The nut-rage incident, it added, is "causing anti-corporate feeling to spread further among the public." © 2014 CBS Interactive Inc.. All Rights Reserved.